Gaining more distance from changing your golf balls for those longer Par 5’s is a great way to hit further drives. The best golf balls for distance will have less spin that results in less resistance and more golf ball roll. The best golf balls for longer drives are the Titleist Velocity Golf Balls that have an impressive core and aerodynamic design. On top of this, they are excellent value for money for such a reputable brand and high-quality ball. In general, the harder the golf ball, the further it will go. A 2 piece golf ball is usually much harder as it has reduced layers and will fly the farthest. Minimal compression for slow swinging golfers (less than 90 MPH) is advised for longer drives. Switching up your balls is probably the last thing you would think of to increase the distance of your shots. When it comes to distance, the majority of golfers will look into buying the best drivers for longer drives or book more golf lessons. Distance from the tee and your second shot usually requires distance. Adding an additional 20 to 50 yards by switching your golf balls for distance can see your score look much more promising. The amount of different golf balls you can buy goes into the thousands. To help your buying decision easier, below is a list of the best golf balls for distance. Titleist Velocity golf balls have the most sophisticated core available on the market. There are three factors that make this the best golf ball for distance, they include a dimple design, bigger core and a thinner cover system. The spherically-tiled 328 tetrahedral dimple design has the result of more carry and roll. The LSX heavier core provides the faster ball speed under a full contact swing. Both qualities combined is a recipe for the perfect ball for long drives. see added distance. This will give you the confidence to aim for the greens that are usually out of reach. 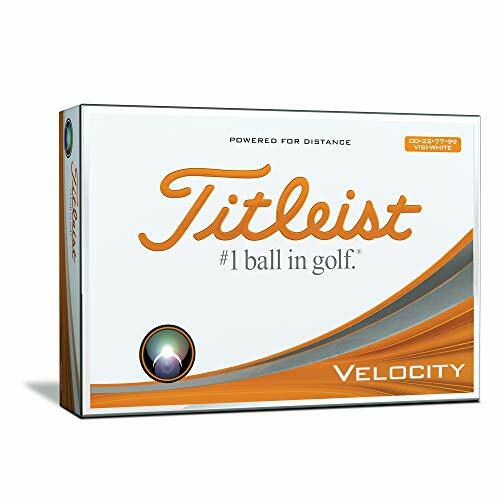 The Titleist Velocity golf balls are the best golf balls for distance and considering they are a premium golf brand, they are reasonably priced too. Another big golfing brand is Callaway and their golf balls, like their drivers, are known for long distance shots. 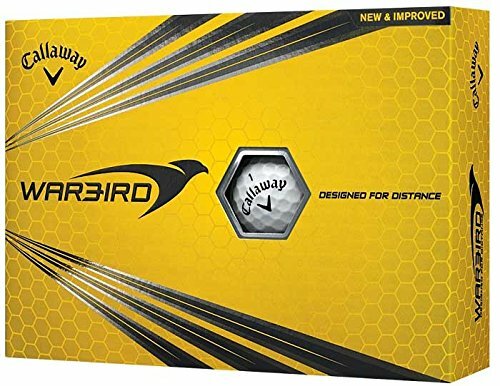 There are many different version of the Warbird Series by Callaway but these are the latest with additional research and development. To achieve the distance, Callaway has designed the 2 piece golf ball primary for maximum flight via the high energy softcore. On top of this, the patented HEX aerodynamics aims to reduce the drag and increase the distance. There is a range of Callaway golf balls to choose from that are 3 piece and have soft cores, however for a long drive, these are the ones you want. Overall, they are cheaper than the Titleist Velocity golf balls with similar specs. If you feel that you lose balls more often, these may be the best golf balls for distance in terms of value for money. They also come in two colors to help you find the ball if you hook it into the trees. TaylorMade has even named their premium golf balls after their use, which is golf balls for distance. 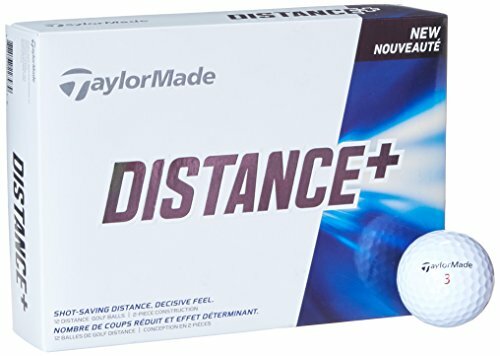 The Distance Plus Golf Balls are highly rated worldwide with a thin cover and extra large core for the most amount of distance possible. They are a 2 piece golf ball designed for mid to high handicap golfers looking for an increased distance with their drive. Like the Callaway Warbird Golf Balls, they come in two different colors and are both similar prices. From using both, there isn’t much in terms of performance that is noticeable but they certainly are better than the 3 piece version designed for spin. 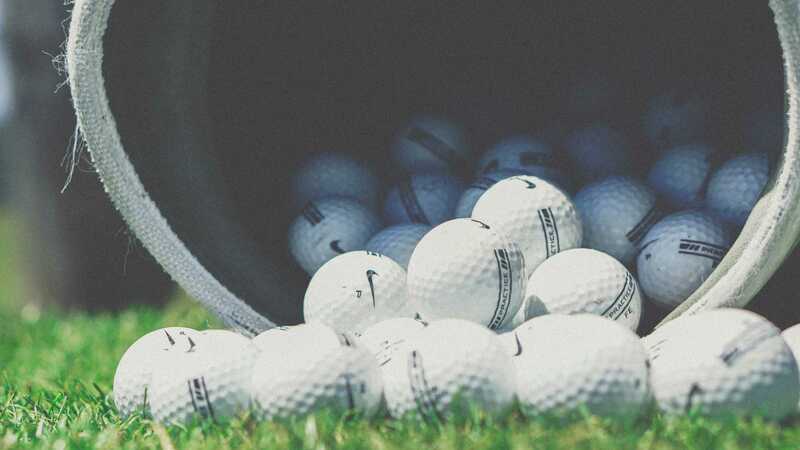 If you are loyal to the TaylorMade brand and do not want to pay the extra for the Titleist Velocity golf balls, these TaylorMade Distance Plus Golf Balls will not let you down. 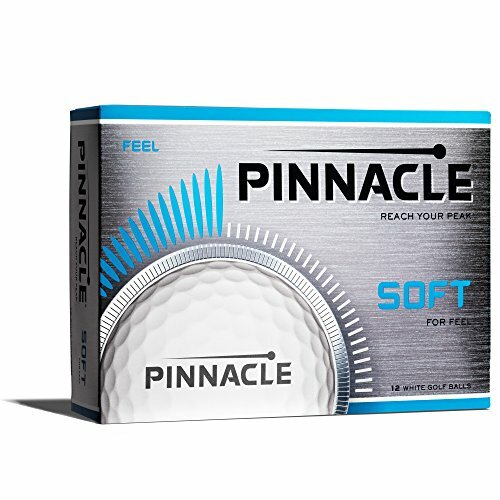 Pinnacle is a long-standing golfing brand that has been specializing in golf balls. These are the softest golf balls in the article and the main selling point. These are very low compression golf balls that are the softest to hit for low spin and long distance shots. There are 332 dimples on the ball itself that ensures the flight in the air is not under any resistance. All golf balls developed by Pinnacle go under strict testing to ensure that they are the best golf balls for distance. The softness of a golf ball is a requirement of many professionals but also to the average golfer. These are the best soft golf balls for distance with all clubs and they are also very reasonably priced. Nitro are not the biggest brands in the golfing market but their golf balls are the cheapest for long distance drives. They use a titanium core that maximizes the energy from the moment of impact to the ball. As with all the balls within this article, they are of a 2 piece construction and use an aerodynamic dimple design for additional distance. The balls come in unique colors that are almost impossible to lose in the rough. For the money, they are excellent value for money and include three more balls than the usual dozen provided by the other manufacturers. 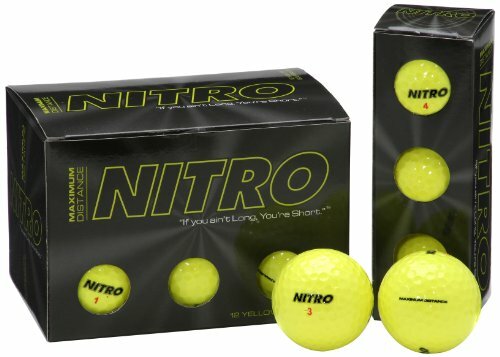 Overall, if you want the cheapest golf balls for distance that can withstand hundreds of hits, the Nitro Ultimate Distance Golf Balls are ideal. Golf balls can be said to be the heart of golf. Without them, the game loses its meaning. A good distance golf ball is not just any ball. In most cases when one is new to the game they can only purchase any ball and then wonder why their game is not advancing. It is not because they are not good enough to become pros, but it is because they just got into the game without knowing which ball is best for the game. There are two popular methods used when choosing distance golf balls. Either BPCA method or RUBT method can be used. RUBT is an acronym of Reading, Understand, Buy and Tweak method. It is whereby a golfer will seek information from different knowledge providing avenues before making a decision. This technique is commonly prepared by consumers since it spares your money that would have been used to buy various balls as you try to get the right one. You get the required technical knowledge for balls you might need as you advance your career. Distance is not the only aspect to consider when buying a ball but also what degree of accuracy and consistency does it provide? There are so many golf balls present in the market but choosing the right one can be tricky. It is why this article is for you to check certain aspects that will help in making a decision. Construction of the ball, distance it travels, its compression, spin characteristics and its market price are factors to be considered. These balls can are grouped into Three. The High spin balls, mid spin balls, and low spin balls. High Spin Balls. These balls have the highest spins of a golf ball than any other. This balls if appropriately stroked accelerates its spin and generate a suitable longer carry. This ball is mostly preferred by professional golfers since they can cause this ball to land and go where they intended. These balls are easy to control since they have an increased feel of the greens. Mid Spin Golf Balls. These balls offer a not too low or no too high spin but a medium kind of spin. This is the most used kind of most players. These balls can offer good carry distance depending on its brand. Low Spin Golf Balls. These balls travel in a straight motion than the others. It is due to their decrease in side spin once it is shot. It doesn’t move for a long while in the air but provides a landing that is characterized with increased rolling. This ball is suitable for a beginner or one who doesn’t need increased spins. 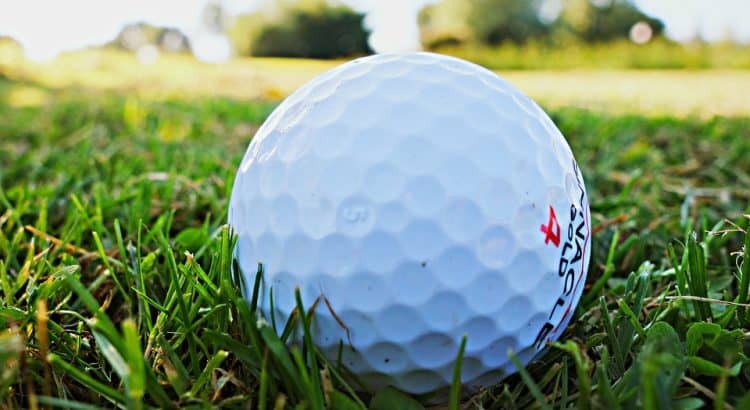 A disadvantage of these spin golf balls is that if they are stuck wrongly, they can travel further that you may not find them even after landing. The construction of the golf ball can be up to 5 different layers. Each layer has a purpose with benefits of having more layer or a small number. 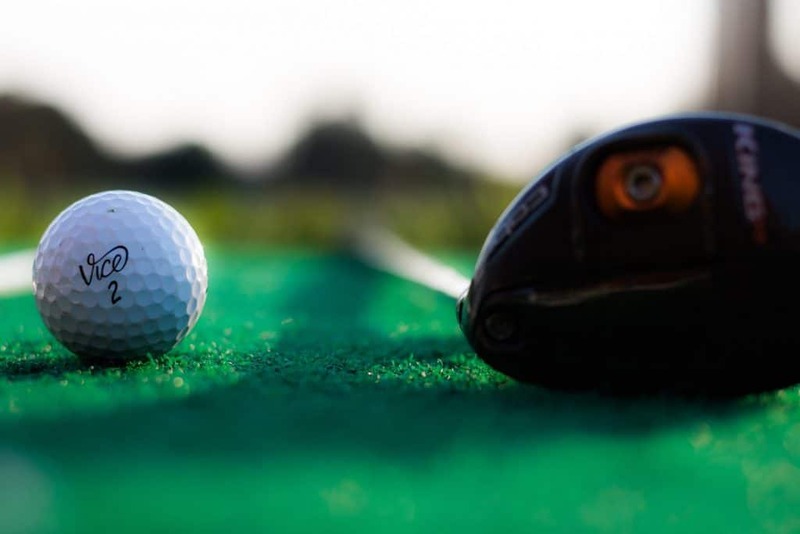 The most common construction is the 2 piece and 3 piece golf balls. 2 piece golf balls are the best golf balls for distance whereas 3 piece offer more spin. Below are details about each golf ball construction. These balls are cheap to buy compared to the rest. They are soft and can last for a long time. They are usually made of Surlyn whereby dimples are molded into it. If you are looking for distance, these golf balls are not suitable. When hit they have a soft feeling that is ideal for beginners. They are made using a single solid acrylate core with high energy or resin which is covered in a durable coating that cannot wear and tear easily. This layer can either be a firm plastic Surlyn or a material with same characteristics. It enables it to travel long distances than all other balls. It requires technique to handle it for it is not as smooth as the one piece ball. It is the most common used ball by golfers. They have a reduced curve are durable and have less spin compared to the others below. The majority of the time, golfers choose the best 2 piece golf balls for distance if they are struggling with that part of their game. It is made of a solid core, liquid or fluid core and an out cover. Surlyn is used as cover or urethane or balata materials. These materials offer a soft feel. They are known to provide more spin as compared to two-piece golf balls. This ball is used by professional since it offers a good spin range due to its increased layers that necessitate in an increase in spin separation. They are not durable when compared to2 piece balls since they can tear quickly due to the soft cover. They are more expensive that one and two-piece golf balls. It is made up of four different layers each serving a different purpose. They complement each other to ensure that they offer the best hitting of the golf ball. The innermost part is made up of rubber core that is solid aimed at providing an excellent distance when the ball is hit using a driver. The second layer is known to increase balls spin.It transfers the strength from the strike to the balls hot core. This middle layer is what differentiates a four-layer ball to a tree layer golf ball. This coating increases the curve and ball power. The outer layer is what that covers the ball.it is made of a soft material to ensure the smooth feel while using it. The cover has over 300 to almost 400 dimples on it. They travel at high speeds and have top spins. These balls are suitable for only professionals and skilled golfers. They are expensive and are not easy to find. This is the latest type of golf ball in the market. It is made up of 5 layers thus its name. The core, the inner mantle, middle tier, outer mantle and the outer cover. Each layer helps in attaining the ultimate goal of efficiency. The base benefits in promoting maximum carry and distance of the ball. The inner mantle enhances soft feel, soft landing and helps the ball settle on the greens quickly. It also promotes low spins off irons that are long but high launches. The middle layer enhances mid spins on mid irons which prevent the ball from shooting high and falling away from intended target. It also helps in Mid launch which aids in control of the ball. The fourth outer layer aids in preferred spins from short irons that helps in the smooth stopping of the ball at the desired position. The outer cover facilitates in average turns that are vital to the scoring area. These balls are very expensive and are used by professionals only. Soft balls are used mostly by professionals this is because they are easy to work around through the air. It doesn’t give much distance but provides better control of the ball. Hard balls are hard when hit, which provides good distance but has reduced spin and control. Compression can be defined as how much it can compress when hit by a club face. It is calculated from 0 to 200 whereby Zero is a ball that diverts more than 5mm. The compression range opted by many golfers is 50 to 100. Golfers who have high swings choose for 100 and above while those with slower speeds choose for 80 to 100. Balls with a significant compression rate offer better ball control and include the five-piece golf ball. Those with minor compression create good distance when on air. They are also known to be softer. There are some common questions anyone who wants to buy a golf ball asks themselves. These issues are due to things they have heard out there and would need them answered correctly. They may include the effects of dimples on a golf ball if collected balls are still suitable for use or where they can purchase these balls. These dimples are meant to affect air molecules that may affect the balls speed. If a ball is hit and is intended to travel at high speeds through the air can get hindered by pressure and air molecules present. This is the reasons why dimples are incorporated on the ball to have an impact on these two aspects. They bounce and roll creating disturbances on air above the ball. These were developed when earlier golfers realized that the original ball which was even all over traveled for smaller distances, which lead to the increased incorporation of dimples to golf balls. Most balls range from 300 dimples to 500 dimples. They have a standard depth of 0.010 inches. If the depth increases even slightly for whichever reason will affect the balls speed. These are balls that a golfer can collect in the lake or on the ground outside. They are balls that were being used by other players fell in places they could not keep looking for them and eventually abandoned them. Tests conducted to show that balls that were submerged in water for some time travel shorter distances compared to a new ball same make. They show that a ball that was in the water for eight days moves 6 yards less. If it sends three months, it travels 12 yards less while six months is 15 yards less. For a beginner, these distances may not mean much, but for a professional, it may cost their win. Some companies are doing the work of retrieving them and later reselling them at a reasonably low price. This can be a good investment especially for a beginner who will probably lose several balls in the woods. In conclusion, as you purchase your desired distance golf ball put these factors into consideration. Consider the price of the balls you are to buy. Do not invest heavily on costly balls that you will end up losing a good number since you are just new in the game. Choose a ball that matches your needs. If you are looking for high spins, go for the appropriate balls. Inquire how many dimples are present in the ball and check if they will help you in the attainment of your goals. If you would need more information on different goal balls made by various companies visit them during their golf fitting sessions in your local club. Before you decide to make any purchase of a golf ball first understand what you want. Once you are aware of what purpose you need it for you can then use this guide to help in making a selection. Thank you an Awesome job breaking these down! Good information, especially about the lake balls.